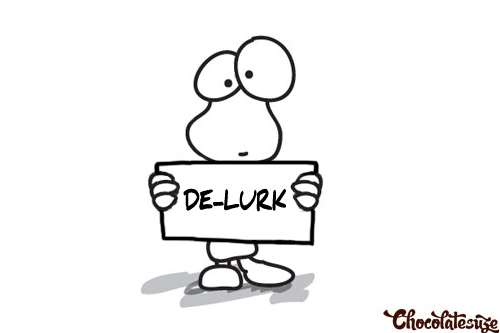 Delurking is a slang for coming out of the online “lurking” mode and this day is designed to invite people who visit but never comment to do so. This is a way of saying hi to some reader who seems to visit often (you know who you are) but don’t comment due to various reasons. So if you are one such lurker of me & my blog, please delurk and say hi, just leave me a little comment so that I know that you do read my blog and appreciate my recipes. hi! I read your other blog more than I do this one. Love the recipes... and have followed you for about a year. Never comment as I was happy just reading. I do receive your email updates (with the new email address). Keep up the good work! I love your blog! I read it all the time and use your recipe for bitoque often!! I LOVE your blog and your recipes!!!! I love your blog and look at it almost every day!!!!! Hi, I do enjoy your blog, and have made some of your recipes. My family loves your slow baked chicken. Sandra, havn't been commenting recently, but I do always read and drool! Hi, there. I will step forward and let you know that I'm here, that I love your recipes, and I appreciate your time and efforts :) You give me a great resource for yummy food my family loves. Hello! I'm completely new to your blog, but I love the recipes you posted on your other blog (which I also only recently found). I look forward to reading your posts in the future! I am in love with your blog and have made a handful of recipes so far. Feeding a family of 7 with food allergies is tough and I like that alot of your recipes can be made without the allergens. The banana choco chip squares are a Saturday morning tradition now! Hi Sandra! I always read both of your blogs and I use a lot of your recipes. Just last week I made the bacon wrapped chicken. Yum! I love the food you share with us and the beautiful photos that you take. I read this blog and enjoy it! You are quite creative. I'm saying hi! I've commented once or twice, but I love your recipes! I'm am a lurker! The only reason I never commented before is because my old computer would never let me! But now that I have a new one, I can actually do so! You have a great site! You do an amazing job with the photos! Everything always looks so yummy! I am a subscriber by email but don't comment often. Thank you for your blog and the wonderful recipes you share. Will try to remember to comment more. I love the graphic by the way. Have a great week. I love your blog and love your recipes. Each one I've tried has been a HUGE hit!! HI! I don't seem to comment often but I do love your blogs! You have saved dinner at our house many a time! I was just looking through the new and the old blog and see some great new to me recipes to try! Thanks for sharing your recipes with us! Hi! I read your blog and have made several recipes. I never comment, but I alway read! Love your recipes! Thanks for posting them. Love your blogs and your recipes. I can't tell you how many of your recipes I've tried but I can tell you that we have loved all of them!! Take care. Well you caught me. I do follow your blog and have used some of your recipes. Thanks for blogging and keep up the good work. Well, you caught me. I have been following your blog for a long time. Thanks for posting great recipes. Keep up the good work. I am a reader that enjoys your recipes! Hi, Sandra! Still happily lurking but I have to mention that one of our favorite recipes is the Portuguese Skillet Chicken and Portuguese Roasted Potatoes. It's become a go-to recipe and is on our menu regularly. So, a big thank you for taking the time to share! I love your blog, but don't post much! Keep up the yummy food! Love this site! I always come away with ideas. Hello from an American in Sweden! We've tried several of your recipes and all have been great, but our favorite so far is Bacon Honey Mustard Chicken. Delish! Looking forward to making your Creamy Oven Chicken this week. Thank you for sharing your wonderful recipes and for all your time! Guess I'm a lurker, haha. :) I love your blogs and use several recipes regularly. The french dip sandwich is a particular favorite. I hope you continue to post slow cooker recipes. Love your photography. Thanks for sharing and inspiring me. I love your blog too...but I am a lurker !!!! Every recipe I have tried has been amazing. O'w that would be me.........I'm gonna de lurk today. Most the time i lurk because I can't remember my passwords. I'm a lurker. I love your recipes and enjoy your blog. I'm just too shy to comment. I am not a lurker..just saying hello because I just signed up today! Thank you for all of the great recipes - I am new to your blog and I am really enjoying it. Thanks for your blog. I enjoy having recipes that a family can enjoy. Good meat dishes-roast chicken, pork chops, etc. Well, I'll bite, discovered your blog last year, shortly before it went into hiding, and really like the ideas I get from it. so Hi! I'm Devilham, and I likes what I read here...keep it up! I have commented before (only once, I think), but just wanted to say thanks for the recipes. I especially enjoy the ones from your homeland. That's supposed to be roll up my SLEEVES!! Thanks autocorrect. Hi! I am a delurk-er!! LOL. I LOVE your recipes! I read your blog often! Thank you for all...you rock!!! Hi there! I have "talked" with you before, but it's been awhile. I am not online as much as I used to be with our 1st baby in the house now. I love your blog because it is the only one I have found that features Portuguese recipes and is written in English. My family is Portuguese but aside from me learning a few basic words, I do not speak it. But, my great grandma used to make me lots and lots of Portuguese recipes that I miss so much! I try to recreate some of them by memory. Anyways, just wanted to say how much I appreciate what you do on your blog, I enjoy reading your recipe posts and getting new ideas for my little family now. Thank you! I appreciate your recipes. I don't have a lot of time to cook, but the recipes that we have tried, my husband and I both enjoyed. He even liked your lemon cookies, and he isn't a lemon man! I am going to try to make more of these, they look so delicious.